The term 'specific learning difficulty' (SpLD) covers a range of learning differences that impact on your study. The table below shows examples of specific learning difficulties and some of the main effects on your skills. The support we provide depends on your specific learning difficulty and how it’s likely to affect your studies. Your previous learning experiences will help you to know what works for you. You can take a diagnostic assessment to provide evidence of your specific learning difficulty and identify your study needs. Our booklet, Study with Dyslexia (PDF, 603.2 KB) contains information to help you in your study. At the start of your module discuss with your tutor how you prefer to learn and what might help you. This could include using a portable recorder during tutorials instead of writing notes, arranging an extra individual tutorial if required or agreeing extra time to help you complete an assignment. If you struggle during your studies your tutor can help you get back on track. You can find their contact details in Contact the OU. a scribe - someone who writes out the answers that you dictate. Make your exam arrangements in good time as we’ll need documentary evidence (such as an assessment report) to support your request. During exams, try to use the same method of producing written work as you do for assignments. If you need a scribe, we can organise practice sessions beforehand so you can get used to this way of working. If your module has a compulsory residential school we’ll work with you to make your stay beneficial and effective. Discuss disability support at residential school with an adviser as early in your module as possible to give us enough time to make arrangements. 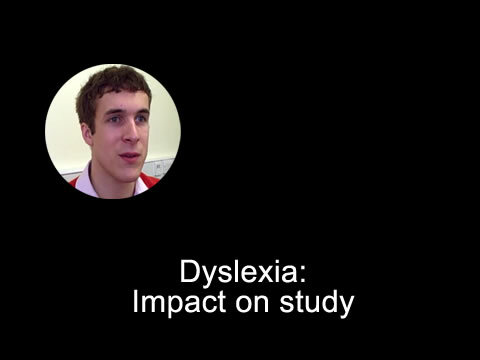 Learning difficulties such as dyslexia can affect your study, as OU student Alex Wise points out. Alex: Dyslexia prevents me from really organising my notes or organising my argument when writing an essay, so organisation skills are a real weakness with my dyslexia. Grammar, punctuation, argument, development and things like that are hindered, but it's also my ability to take notes during tutorials, or my ability to engage fully in a tutorial because I might not be able to copy the work off a board, or I might not be able to keep up with a PowerPoint presentation as quickly as other students, and it can leave me feeling very vulnerable in a situation such as a tutorial. This website is developed and maintained by Online Student Support Services. This page was last updated on 3 September 2018 at 12:48:46.